For many first person shooter games, there are levels where players need to be inconspicuous as they methodically butcher various characters. While some employ useful tools like a cardboard box, simple chokehold, or even a knife, the go-to method of dispatching electronic antagonists in a quiet manner has long been the silencer. The silencer has been a staple in the action genre long before video games, of course, used in an assortment of espionage and noir films to maintain a low profile while abruptly ending the life of a character with thoughts, feelings, and dreams of their own. Audiences are familiar with the cylindrical tube affixed to a pistol and the oddly satisfying “thweet” noise it makes instead of the loud bang of gunfire. But how accurate is this depiction in the vicarious bloody rampage entertainments so many enjoy? Turns out not very. YouTube user RagnarRox posted a video that looks at all of the various ways video games and films have been misusing silencers for many years. For starters, no one calls it a “silencer” outside of a work of fiction. The tools are known as “suppressors” because it’s basically impossible to silence the sounds made when firing a gun. 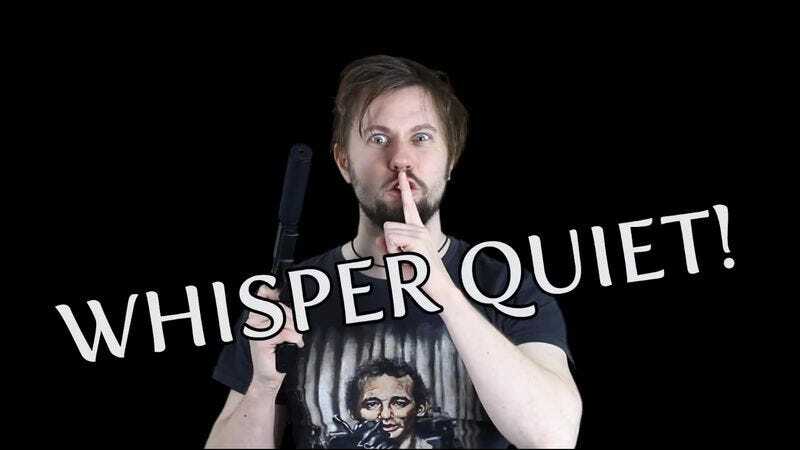 The video showcases the various decibels reduced by a suppressor and while it is significant, it is simply not even close to the stealthy agent of death used by Sam Fisher or James Bond. RagnarRox does a great job of walking through the mechanics of firing a gun and the subsequent noises it makes to explain why silencers—er, suppressors—are really more for protecting the hearing of the shooters than concealing their locations. Which makes sense as tinnitus seems to be a real problem facing even the greatest of secret agents. It’s important to note that RagnarRox isn’t saying that these games are invalid because of its mishandling of suppressors—as if that’s the lone element that belies belief in an otherwise realistic game. He’s simply pointing out that certain elements of entertainments that audiences and gamers have embraced are really just accepted myths that hew closer to plot necessity than the physics of the real world.